We believe attorneys are uniquely poised to develop programs and offer assistance to Ohioans with unmet legal needs. We believe our democracy works better when people understand the law. We believe everyone deserves fair and equal access to justice. Each and every one of us is affected by the law and it’s not always as simple as following the posted speed limit. The law is a complex system of precedents, rulings and research. Many people turn to lawyers in times of need – during stressful, vulnerable episodes in their life, often when hope seems lost. Lawyers help solve problems and anticipate the needs of their clients. 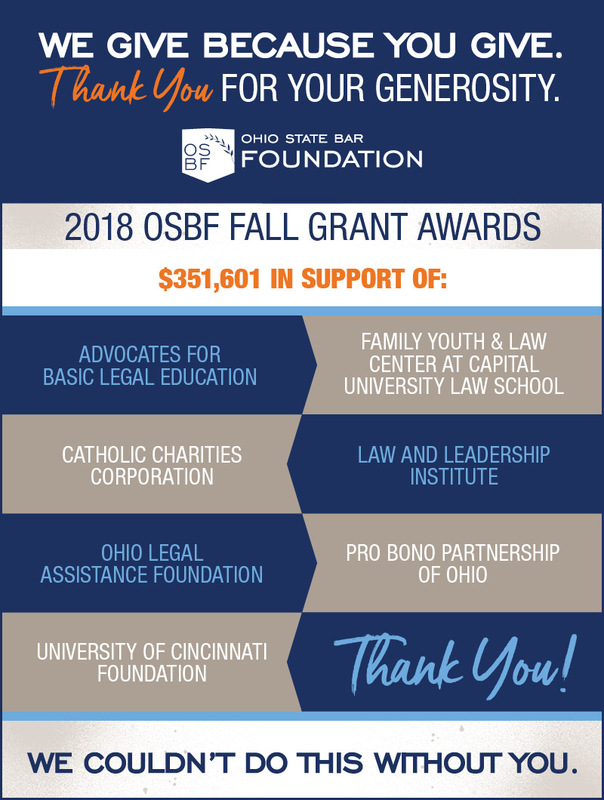 At our core, the Ohio State Bar Foundation is an extension of the dream many attorneys had when they committed to law school – to change the world and help others. The Foundation converts those idealized dreams into real-world actions and impact through law-related philanthropy in communities across Ohio. At the Ohio State Bar Foundation, we pride ourselves on being the best possible stewards of your investment – we value transparency and invite you to review our 2017 Financial Report to learn more about the impact of your donations. Do you know any exceptional attorneys who have demonstrated their dedication to both the legal profession and their communities? Nominate them to become Fellows. Thank you to Bahl & Gaynor Investment Counsel for their sponsorship of the 2017 ALL RISE annual awards dinner. See a listing of all our generous sponsors. Read about the latest news and updates from OSBF.